Women are different from men. We can all agree on that. They look different, most of them. They act differently and they think differently. 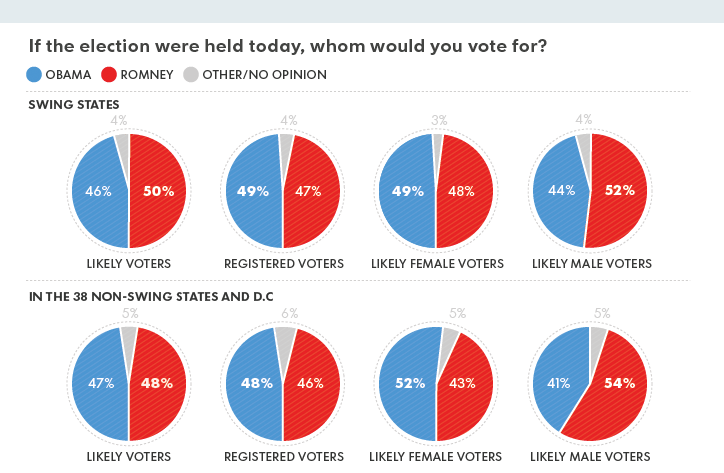 These pie charts published by USA TODAY illustrate that women vote differently as well. Also notable in the charts is the difference between the methods of the two leading pollsters, Gallup and Rasmussen. Gallup polls all registered voters; Rasmussen polls only those more likely to vote. The difference is quite clear in the swing states, the two upper charts at the upper left. This entry was posted in News and tagged Gallup, Rasmussen, women voters. Bookmark the permalink.